Not only will LG show off a levitating Bluetooth speaker at CES, the Korean electronics giant also has new TONE audio products on the way. The two new TONE options are the TONE Studio and TONE Free, both of which offer their own unique take on the collar audio trend that LG seems to be fully invested in. 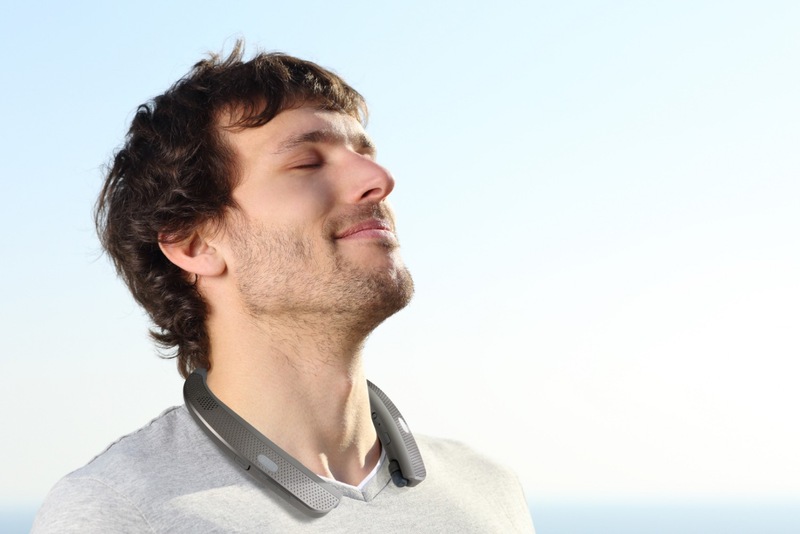 With the TONE Studio (HBS-W120), LG is going with the dog collar that’s not just headphones, but an external speaker. Yes, it’s a wearable speaker. Look at the picture above and tell me you aren’t in need of whatever that guy is listening to. That’s pure f*cking bliss, people. Seriously, this guy is feelin’ that vibe. My lord, get ? me ? some ? of ? that ? now. But really, though, the TONE Studio is a wearable speaker that features four speakers. It’s supposed to offer a surround sound experience, includes a HiFi DAC, and can be connected to a second TONE Studio, to offer shared sounds from your devices. It appears to include connected earbuds as well, should an external speaker not be appropriate. As for the TONE Free (HBS-F110), you get LG’s first wireless earbuds that can be stored in the collar for charging or just so that you don’t lose them when not in use. If wearing a collar around, while using wireless buds seems like an odd combination, that’s OK, because LG is including a separate charging cradle too. LG says that its new TONE products are only a sample of what we’ll see at CES. We’ll be there to find out!